Anodising is an electrolytic passivation process used to increase the thickness of the natural oxide layer on the surface of aluminium labels. The process is called anodising because the part to be treated forms the anode electrode of an electrical circuit. Anodic films is also used for a number of graphic effects, with thick porous coatings that can absorb dyes. 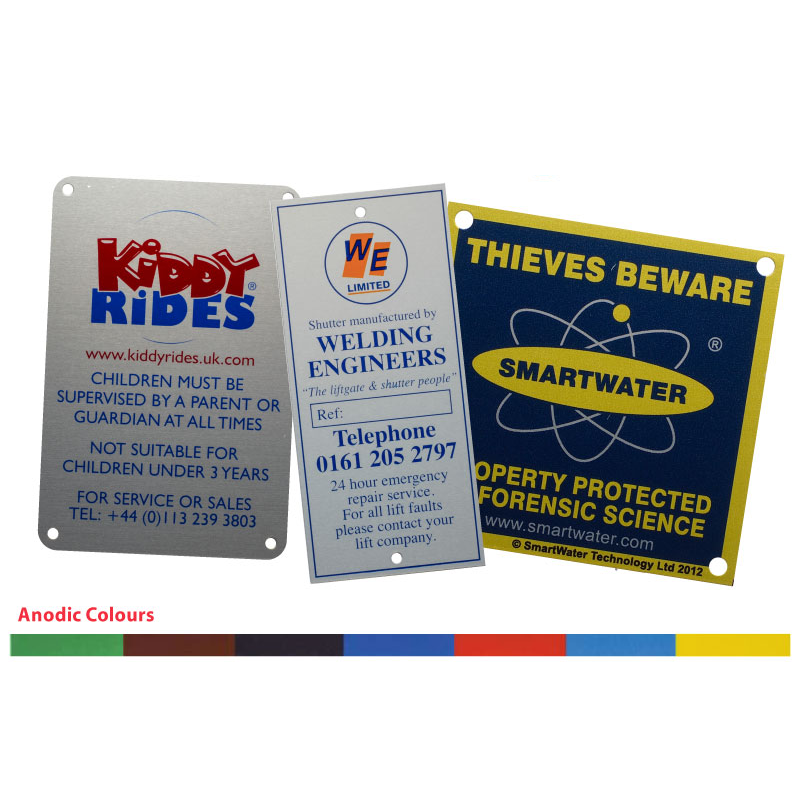 Anodised Aluminium labels and nameplates are particularly durable because the design is absorbed into the surface of the aluminium and not just on the surface as would be the case with a conventional printing ink. Anodising changes the microscopic texture of the surface and the crystal structure of the metal near the surface. Thick coatings are normally porous, so a sealing process is needed to achieve corrosion resistance. Anodised aluminium surfaces are harder than un-anodised aluminium. Anodised aluminium labels are also particularly suitable for use as rating plates, where blank panels can be included in the design for later insertion of variable information. Variable Information, Consecutive Numbering etc. Aluminium is highly suitable for the addition of variable information (either at the point of manufacture or on site by the customer) by utilizing metal punches to permanently indent data into prepared panels on the plate. Also, our computer controlled numbering machine can consecutively number your plates with virtually any height of number you require. The thickness of the aluminium used normally ranges from 24 swg. (0.5 mm) to 10 swg (3mm) but other gauges are available to meet particular requirements. 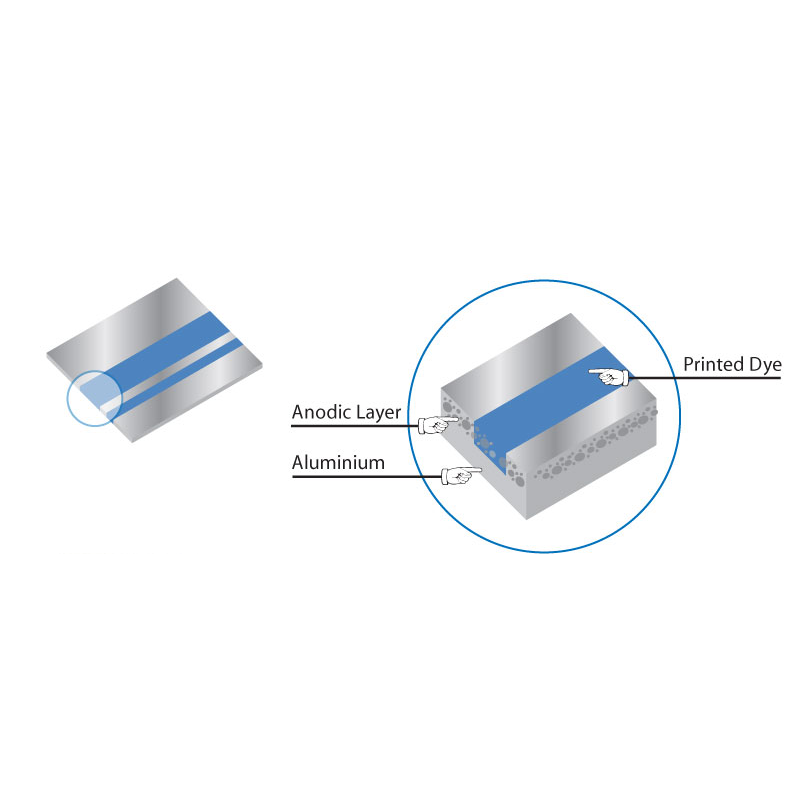 This Diagram shows the composition of our Anodised Aluminium Nameplates and illustrates how the dye penetration makes the print so durable. Our stock anodic colours are Black, Red, Dark Blue, Light Blue, Green, Yellow, Brown, all of which are available in an attractive satin brushed finish. Please note that all anodic colours (with the exception of black) are transparent dyes, and so give metallic colours, Pantone or other non-metallic colours are available, but these would be surface printed inks, which are not as durable as the anodic colours. To ensure that your labels are produced to the highest standard, at the best possible price, we utilize the very latest computer controlled metal punching press. Most standard fixing holes, radius corners etc. are available free of charge from our vast range of stock tooling. For special requirements, we can supply custom tooling at low cost. A range of medium and hi-performance pressure sensitive adhesives can be specified for coating onto the reverse side of the nameplates. They are supplied with an easy to remove release liner. The face side of the nameplate can also have a cleanly removable clear protective film applied, which will help to preserve the pristine appearance of your nameplates during manufacture or assembly of your product. The face film can also act as a paint spray mask.